Your Feb. 28 article, “Scrutiny urged on piping of tar sands through Maine,” was an excellent summary of two versions of the same facts. Elders for Future Generations, whose mission is to speak out on current issues in Maine that will have an impact on our grandchildren, urges your readers to pay close attention to the need for much more scrutiny of all the facts on transporting tar sands oil in the Portland-to-Montreal pipeline. Whichever side of the proposal you choose to believe in, the need for a presidential permit and the related environmental impact assessment it requires, is critical. • Because reversing the flow of oil in the existing pipeline from Montreal to South Portland is subject to minimal state and federal evaluation and regulation. • Because the pipeline is 62 years old and was built before the current standards. • Because the pipeline crosses numerous waterways where a pipeline fracture could lead to oil spilling into Sebago Lake, the water supply for 200,000 people in Greater Portland. 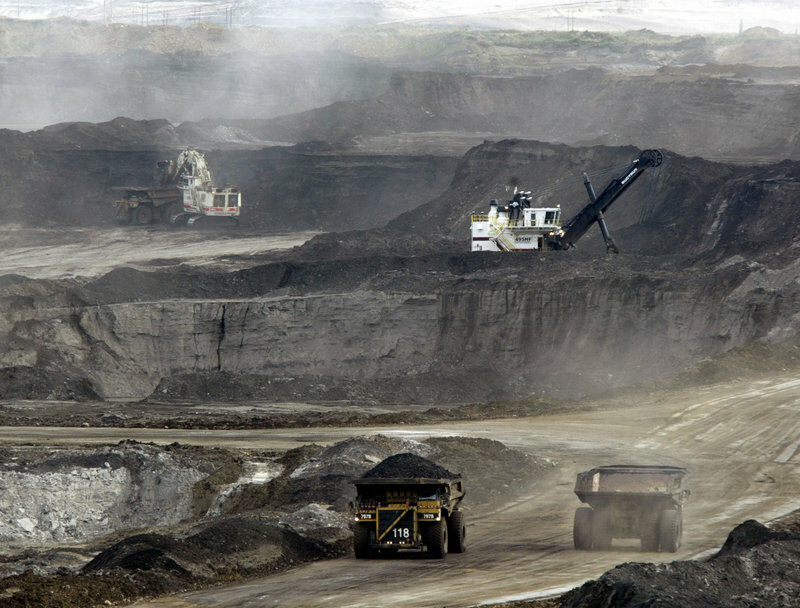 • Because tar sands oil is corrosive, toxic and difficult to clean up. • Because the proposed 70-foot stacks at the Bug Light pier in South Portland would be an eyesore and a potential source of toxic off-gases that will have a negative effect on quality of life in that scenic area. • And because the oil will be shipped out of country and be of limited value to the U.S. and Maine. Don’t agree? Fine. Let’s get the facts and have that environmental impact study and a presidential permit process. We are gratified that U.S. Reps. Chellie Pingree and Mike Michaud agree with our position and have asked the secretary of state to require this process. We’ll all sleep better knowing there will be a decision based on a serious weighting of the costs and benefits of this proposal done under public scrutiny. And future generations will thank us. Many thanks to U.S. Reps. Chellie Pingree, Mike Michaud and 16 other members of Congress for urging Secretary of State John Kerry to require an environmental impact study before tar sands are pumped from Montreal to South Portland through Maine’s old pipelines. • Tar sands is radically different from crude oil. • Tar sands is more likely to create pipeline spills. • Tar sands spills cannot be cleaned up. • Two smokestacks would have to be built on the pier in South Portland to burn off toxic chemicals used for tar sands transport. High heat is a principal reason for pipeline leaks and ruptures. The higher the level of bitumen, the higher the heat. Studies show the risk of leaks is significantly greater when heat is above 100 degrees Celsius. Tar sands heat is 150. Nearly 1 million gallons of tar sands still lie at the bottom of Michigan’s Kalamazoo River because the Environmental Protection Agency could not remove it. Businesses have closed, real estate values dropped, people relocated and cleanup stations set up along the river in case of contamination from contact. Maine’s pipeline runs extremely close to Sebago Lake (the source of our drinking water) and crosses its main tributary, the Crooked River, multiple times. These facts make an environmental impact study necessary for us and future generations. I am writing in response to the folks who are opposed to “tar sands.” I find it ironic that the people who are so concerned about managing the environment in a “sustainable” way are seemingly unconcerned about managing our economic affairs in a “sustainable” way. I have confidence that our engineers and regulators can determine whether or not it is safe (and cost-effective) to pipe this type of oil through Maine. I am far more concerned about Maine’s high energy costs contributing to an exodus of our citizens as they are forced to look for jobs elsewhere than I am about an exodus of people as a result of some sort of freak environmental accident. Even worse, we have citizens who are being “sustained” by largely borrowed welfare monies because we have a lack of good jobs. We seem to be “polluting” our children with debt obligations that their parents seem unwilling or unable to pay. How about putting a “sustainable” economy on a par with a “sustainable” environment? Much of the debate about the tar sands pipelines has centered on the potential for oil spills. While spills are a significant risk, the impact on the climate is the overriding concern. The change in the climate that has already occurred is obvious. First frost comes in mid-October instead of mid-September. Apple trees blossom in April. Lake ice is unsafe well into January. Insects like ticks that were once frozen out of Maine are migrating north, with the diseases they carry. The U.S. and Canada are the top two per capita energy consumers in the developed world. In the U.S., it is commonly accepted that cheap energy is a prerequisite for a healthy economy. If so, why is Germany, where gas sells at $8.56 a gallon, the economic juggernaut of Europe? • The ski and snowmobiling industries will suffer from less snow and shorter winters. • The maple sugar industry will decline as maple trees die off. • The shellfish industry will decline, with warmer ocean water and carbon-induced acidification. • Coastal communities will see more frequent and severe flooding. We need to wean ourselves from fossil fuels, not add sources with energy-intensive extraction requirements. Climate scientists overwhelmingly recognize that the planet is warming dramatically and that the future risks are daunting. A handful of bogus studies funded by ExxonMobil and other fossil fuel interests have perpetuated uncertainty. We need President Obama to require environmental impact assessments for pipelines carrying tar sands in Maine and elsewhere, and for Maine’s congressional delegation to be leaders on enacting federal climate policy.